Tel Aviv University research says unique structure is the product of skilled construction.The shores of the Sea of Galilee, located in the North of Israel, are home to a number of significant archaeological sites. Now researchers from Tel Aviv University have found an ancient structure deep beneath the waves as well. 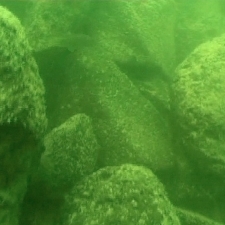 An underwater photo shows the structure is made of basalt boulders. Researchers stumbled upon a cone-shaped monument, approximately 230 feet in diameter, 39 feet high, and weighing an estimated 60,000 tons, while conducting a geophysical survey on the southern Sea of Galilee, reports Prof. Shmulik Marco of TAU’s Department of Geophysics and Planetary Sciences. The team also included TAU Profs. Zvi Ben-Avraham and Moshe Reshef, and TAU alumni Dr. Gideon Tibor of the Oceanographic and Limnological Research Institute. The team of researchers initially set out to uncover the origins of alluvium pebbles found in this area of the Sea of Galilee, which they believe were deposited by the ancient Yavniel Creek, a precursor to the Jordan River south of the Sea of Galilee. While using sonar technology to survey the bottom of the lake, they observed a massive pile of stones in the midst of the otherwise smooth basin. Curious about the unusual blip on their sonar, Prof. Marco went diving to learn more. A closer look revealed that the pile was not a random accumulation of stones, but a purposefully-built structure composed of three-foot-long volcanic stones called basalt. Because the closest deposit of the stone is more than a mile away, he believes that they were brought to the site specifically for this structure. To estimate the age of the structure, researchers turned to the accumulation of sand around its base. Due to a natural build-up of sand throughout the years, the base is now six to ten feet below the bottom of the Sea of Galilee. Taking into account the height of the sand and the rate of accumulation, researchers deduced that the monument is several thousand years old. Next, the researchers plan to organize a specialized underwater excavations team to learn more about the origins of the structure, including an investigation of the surface the structure was built on. A hunt for artefacts will help to more accurately date the monument and give clues as to its purpose and builders. And while it is sure to interest archaeologists, Prof. Marco says that the findings could also illuminate the geological history of the region. “The base of the structure — which was once on dry land — is lower than any water level that we know of in the ancient Sea of Galilee. But this doesn’t necessarily mean that water levels have been steadily rising,” he says. Because the Sea of Galilee is a tectonically active region, the bottom of the lake, and therefore the structure, may have shifted over time. Further investigation is planned to increase the understanding of past tectonic movements, the accumulation of sediment, and the changing water levels throughout history.